Movie tie-in DLC set in Pakistan will benefit military charities. Osama bin Laden, arguably the most notorious terrorist of our time, is dead and gone, but Electronic Arts will urge players to continue the hunt for him this Fall. No, the software giant hasn't embraced necromancy (yet), but when Medal of Honor: Warfighter launches in October, the Zero Dark Thirty map pack will launch with it. This $10 add-on will include two locations from the bin Laden manhunt, and tie in with the upcoming movie Zero Dark Thirty, which chronicles the event in detail. Furthermore, EA will donate 10% of each map pack purchase to military charities, aiming to provide at least $1 million for veterans and their families. To get the disappointing news out of the way first, neither map included in the pack actually allows players to hunt and kill bin Laden, instead simply providing new environments that play host to competitive shootouts. However, both environments are real-world locations: the Darra gun market, and the northern Chitral region, both in Pakistan. The actual bin Laden connections in both locations are somewhat tenuous, but both will likely play some role in Zero Dark Thirty. 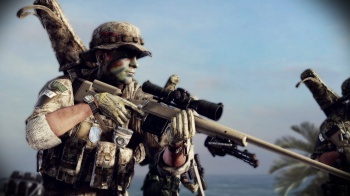 At $9.99 a pop, EA plans to donate $1 from each purchase to its Project HONOR campaign, which benefits the Navy SEAL Foundation and the Special Operations Warrior Foundation. To reach its goal of $1 million, EA will have to sell a million map packs. This may sound like a lot, but the Zero Dark Thirty DLC will come as a bonus to those who pre-order Warfighter, or track down its Limited Edition after release. Whether EA can move a million presale units or individual map packs will be decided largely by the game's merits and the market's receptivity, but its goal is laudable, even if the DLC in question doesn't bring players as close to killing bin Laden as they may want. Few would deny that SEAL Team Six did a great job, but there is still a line of people out the door and around the block - well, actually, around the world - who are still waiting for the chance to get some digital catharsis.